The devil had come to Adam in the garden full of deceit to bring upon him the curse of death. Now Judas, into whom the devil had entered, comes full of deceit to Jesus in the garden, betraying Him to death. But Jesus is not like the old Adam, who hid among the trees in fear. He is the new Adam who has come to undo the curse by His cross. Jesus goes forth boldly to meet His captors, fully prepared to drink the cup of judgment given Him by His Father. Jesus is the great I AM, the eternal God revealed in the burning bush to Moses. His name causes His enemies to draw back and fall to the ground. For all who do not call on His name in faith will fall to their own destruction. Yet He who took up our humanity submits to their capture, saying “Let these go their way,” so that none of the disciples given Him would be lost. For Jesus came that they and all of us who bear His saving name might be released from the powers of darkness. This victory is won not by the sword but by sacrifice. Jesus is led away in chains as if He were a dangerous criminal. For His teaching threatens those who are self-righteous. He is questioned by the religious leaders and then slapped in the face for the answers He gives. They are not really looking for answers but excuses to execute Him and to justify their deeds. We also slap Jesus in the face whenever we try to justify ourselves and don’t humbly pay attention to preaching and His Word. Peter has three chances to confess that he knows Christ. Three times Peter fails. He would have to live for a while with the awful emptiness of his disloyalty and failure. We know that weakness of the flesh, too, when we deny Jesus with our words or behavior, seeking to avoid negative consequences to our reputation or our income or our life. Apart from Christ, Peter can do nothing, in spite of his good intentions. Jesus had told Peter this would happen. Jesus did so not only to cut brash Peter down to size, but also to teach Peter that His love would remain despite Peter’s sin. Peter would call Jesus’ words to mind when the rooster crowed and weep. But he would also realize that Jesus didn’t reject him even though He knew this about him ahead of time. So also with you-Jesus knows you and how you will stumble and falter. And yet He doesn’t reject you; He sticks with you despite yourself. The rooster’s crow is not only a call to repentance but also a call to faith in Jesus’ constant love. The Jewish leaders do not want to enter Pilate’s Praetorium, especially during this time of the Passover, lest they be defiled by being in a Gentile building. But they are already defiled within by their sinful motives and desires. So also, we are all too often concerned about outward righteousness and appearances, when the Lord looks at the heart and desires the inward righteousness of faith. To be undefiled is to confess your sins for what they are and to trust in Him who is faithful and just to forgive our sins and cleanse us from all unrighteousness. Jesus stands before Pilate. Pilate received His authority from God. And now God in the flesh humbles Himself to be placed under this authority. The Judge of all men is being judged by a man. Judgment should be based on truth, but the only thing Pilate can say is “What is truth?” All fallen human beings are liars, the Psalm says. But Jesus is Himself the truth. He is reality. He is the way things are, the truth of God’s mercy shown to those who have not deserved it. Pilate finds Jesus innocent, no fault in Him at all. But the crowds don’t want Jesus, they want Barabbas. The violent robber goes free that Jesus might rob us of our sin by being violently executed. The one who took life lives; the One who gives life dies. This is God’s good and gracious will, that Christ should die in the place of sinners. Jesus goes to death in our place, so that we might live forever in His place, in His kingdom, which is not of this world. Pilate’s plan to release Jesus fails. The Passover Lamb will be sacrificed by the Father to take away the sin of the world. Such people of this world follow those with the power and the influence. “We have no king but Caesar,” they say. But earthly rulers fail you, as it is written, “Trust not in princes, in mortal men who cannot save.” Only this King, Jesus, can save. He exercises His authority not be being served but by serving, giving His life as a ransom for His subjects. He saves not by killing but by being killed, sharing in our mortality so that we might share in His immortality. Jesus is crucified at Golgotha, the Place of a Skull. His cross, like a dagger, is here stabbed into the Skull. And in this way death itself is killed. Though His feet are pierced, yet those same feet crush Satan’s head and pulverize the power of the grave. The religious leaders don’t like the fact that Pilate put the title over our Lord’s head, “Jesus of Nazareth, the King of the Jews.” They ask him to change it. But the earthly authority whom God has established says, “What I have written, I have written.” God even causes this pagan ruler to proclaim the truth. Jesus is the King of the Jews, that is, the King of all those who are the true children of Abraham, who trust in God’s promises in Christ, and who are credited with His righteousness by grace alone. 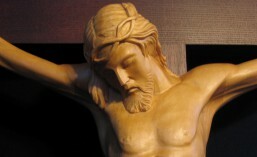 Christ is naked on cross. He bears our shame. We try to cover ourselves with the flimsy fig leaves of blame and denial. But God strips away our excuses. The darkness must be exposed to the light. The sin must be laid bare. And so Christ hangs naked, covered with our shame, so that we might be covered with His seamless garment of righteousness. Jesus honors the woman who bore Him, who nursed Him, who raised Him. And He honors His disciple, who stood by Him with His mother in this difficult time. “Woman, behold your son. Behold your mother.” Jesus’ words create a bond closer than family and bring comfort to those who mourn. Mary and John here picture the church and the pastors who care for her. They are given to receive and honor each other according to the word of Jesus. Then Jesus says, “I thirst.” He is parched, dried out by the arid barrenness of our sin. He becomes bone dry for us so that through Him we might we be drenched with living water, doused with His Spirit in baptism and the Word, drinking up His mercy in the cup of His Supper. He thirsts for you, so that you might learn to hunger and thirst for His righteousness. Finally Jesus says, “It is finished.” That’s all one word in Greek-it is finished. It is the last Word, the Word that declares that all has been fulfilled; everything has been accomplished to secure your salvation and win your forgiveness. Nothing more needs to be added. The job is done, finished, paid in full, a completed gift given to you, no strings attached. These are good words for you to remember when you are in doubt about your salvation, or when you are afraid of death. Remember and believe what Jesus said, “It is finished.” You are perfected and complete and at peace in Him. Jesus does indeed die as the Passover lamb, for it is written of the Passover lambs in the Old Testament, “You shall not break one of its bones.” The blood of the Lamb again stains the wood. The cross is the Church’s doorpost and lintel. Inside the house of God, we are safe. Death passes over where the blood of the Lamb has been applied. A soldier pierces Jesus’ heart, and from His wounded heart flows water and blood-a fountain for cleansing from sin and impurity. John emphasizes that he’s telling the truth about this; he wants you to pay attention. For the church has her life here, in the wounded side of Jesus, from which flows the water of baptism and the blood of Holy Communion. In those sacraments all the blessings of the cross are given to you. The church is the new Eve, created from Jesus’ side as He sleeps the deep sleep of death. We finish where we began: in a garden. Our Lord is buried in the tomb. By His rest in the tomb He has sanctified our graves and made them a place of rest, a place of sleep from which our bodies will awaken. The holy Seed has been planted in the garden. From this seed immortal life will take root and germinate and bloom. This is a new tomb, in which no one had yet been laid. For Christ is the firstfruits of them that sleep. Be buried in Christ by faith, that you may be raised with Him when He comes again. This entry was posted in Devotion and tagged Christ, Christian life, Holy Week, Jesus, Passion. Bookmark the permalink.